I want to provide my readers with empowerment and motivation to go forward with finding purpose through God's leading. 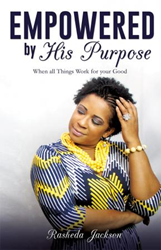 Rasheda Jackson’s new book, Empowered By His Purpose - When All Things Work For Your Good, ($10.99, paperback, 9781498459204; $5.99, e-book, 9781498459211) shares a personal journey into finding her true purpose in God. She reveals how her adversities – that began as a pregnant teenager – turned out to be some of the greatest blessings in her life. She explains how each challenge helps one to learn to trust God’s plans and follow His path and that fulfilling dreams begins with first defining purpose. Prayers and questions at the end of each chapter will help readers with life applications of God’s Word. This book will encourage readers of every age, from teens to the elderly. It is a story of triumph over the enemy and an account of redemption through Jesus Christ. It will help people to see that purpose is waiting for them. Rasheda dedicates this book to every person who has been told that they would not be anything in this life, because of the consequences of choices – and to every person who has been faced with the challenges of being a teenage parent. Rasheda Jackson has been a Pastor for 11 years and a Pastor's wife for 14 years. She owns two successful businesses. She has spoken to groups all across America with her “FEARLESS” campaign – teaching how to release fear and pursue God's plan for their lives. This topic makes her a much sought-after speaker for events and platforms that extend past the four walls of the church. She is a natural leader and motivator. Pastor Rasheda believes that every person has the potential to be great. She also believes that it is her purpose to help them realize who they truly are and what they truly are capable of accomplishing. She holds a nursing degree and a business certification that she proudly earned as a 20-year old raising 2 small children. Xulon Press, a division of Salem Media Group, is the world’s largest Christian self-publisher, with more than 15,000 titles published to date. Retailers may order Empowered by His Purpose - When All Things Work For Your Good through Ingram Book Company and/or Spring Arbor Book Distributors. The book is available online through xulonpress.com/bookstore, amazon.com, and barnesandnoble.com.